As women, we are often told that our hair is our crown, one of our most distinctive features. Great hair is seen as a source of pride, but not everyone is born with hair they love. At Wigs.com, we offer a wide selection of wigs for women so that you can have your perfect hair, whenever you want! If you want a wig that feels just like your bio hair, and that you can style as you wish, our human hair wigs are a popular option. 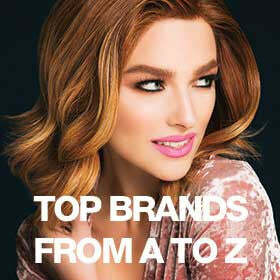 For easier care, great value, and perfect style in any weather, our synthetic wigs are another option to choose from. Similar to our men’s wigs, all of our women’s wigs can be styled by a professional stylist to best suit your personal style if needed! Every woman is different, which is why we provide wigs styles that cater to all types of women, Our African American wigs and our european style wigs are both available in lace front styles. Lace front wigs provide the most natural-looking hairline that can be achieved with a wig, and the majority of our styles come with pre-cut lace, making them ready-to-wear. For our clients experiencing hair loss, we have several different hair loss solutions available including top pieces and toppers. If you are new to wigs and hair pieces, check out our hair loss guide to determine which hair alternative is best for you. Showing items 1-24 of 718.